The case’s design and fit and finish definitely live up to Mophie’s previous battery case product lines as far as build quality goes. The matte black finish is soft in the hand and feels great, although attracts fingerprints like the black iPhone color options. There are also other color options, like the gold color pictured alongside the matte black throughout this review, that may hide fingerprints a little better than the black version I preferred. The case measures in at 16.66 mm thick and only slightly tapers in at the edges. It houses a 2525mAh battery that will approximately double the battery life of your iPhone 7. That’s not going to win it any awards for being much slimmer than the competition, but the super polished matte finish helps to distract from that by making it feel particularly nice in your hand. It’s not bulky by battery case standards. The top of the case snaps off (as pictured below) to allow your iPhone to slide in and connect to the integrated Lightning connector. You’ll have no problem getting your device in and out quickly, and the mechanism that connects the two pieces feels substantial enough that I wouldn’t worry about it breaking if you’re repeatedly doing so. 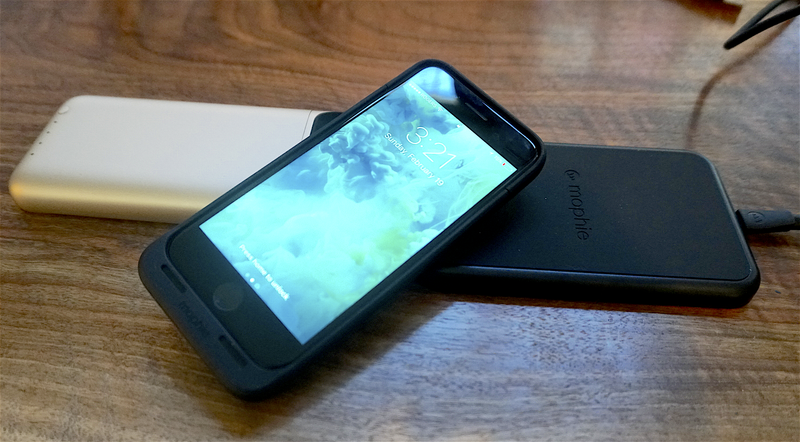 The case works with Mophie’s other accessories. Built-in support for Qi wireless charging means you can optionally purchase the Mophie Charge Force charging base accessory ($39) for use with the Juice Pack Air case. Mophie also sent me one of these to review alongside the case and it does make for a notable differentiator. If you’re going to add a relatively bulky case to your iPhone, you might as well benefit from the wireless charging support that doesn’t add any additional bulk to the case over the competition. Mophie also makes a Charge Force Vent Mount for cars and Desk Mount. Qi charging accessories are nothing new, but this is a nice addition over competitors without it, and a consideration if you can’t hold out for rumored wireless charging planned for the next iPhones. It will also work with other Qi-compatible charging accessories. So if you already happen to have Qi-compatible accessories, like a charging pad built-in to your vehicle, the case should work with those too. Unfortunately the big disappointment for me with the Mophie Juice Pack Air is lack of a Lightning port for charging. The big benefit of this is that you don’t have to carry around a micro-USB cable and can instead have fast charging with the same cable you use to charge your iPhone and other Apple accessories. If you’re traveling, which for me is one of the only times I need a battery case, it’s always nice to have one less cable to bring with you. It’s a nitpick and definitely isn’t a deal breaker, but other cases have it, so I expect it from a Made-for-iPhone case in this price range. Then there is the lack of a 3.5mm headphone jack, which again is possible for Made-for-iPhone accessories and something game controllers and others already do. That’s not something that bothered me personally having made the switch to AirPods, but that and a Lightning port are two things that could have made this the ultimate battery case for iPhone 7/7 Plus. Apple’s battery case for iPhone 7 is a natural alternative. It’s priced similarly to Mophie’s case, has a similarly-sized 2365mAh battery to around double the iPhone’s battery life, and has a just as high-quality fit and finish with a thin bezel and a soft to the touch matte finish. And it has a Lightning port for charging. 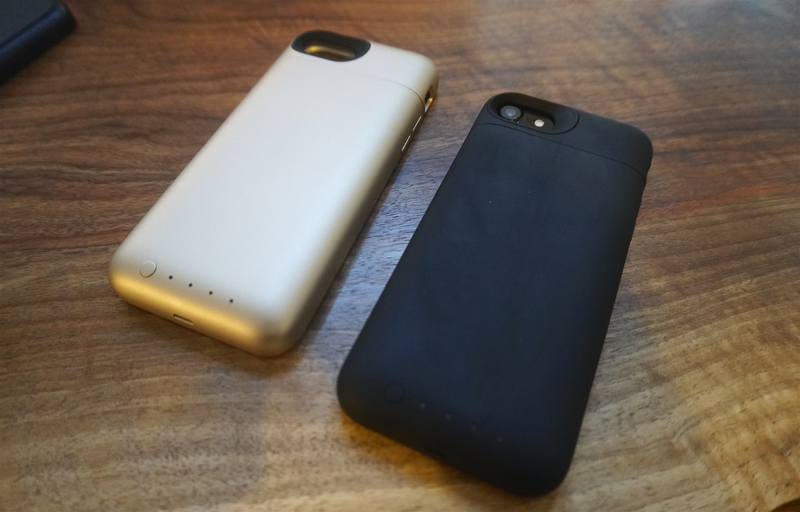 But the design of the case is a bit polarizing, with a bump that protrudes on the back of the case to house the battery and make the rest of the case thinner. Apple is really the only one doing that, as other competitor’s cases more closely resemble Mophie’s design. You’ll take your chances on build-quality with the cheaper alternatives on Amazon, but they start as low as $19.99 for a battery of similar size. If you can swallow the price point that is slightly higher than the competition, and you aren’t sweating the lack of Lightning charging or a 3.5mm headphone jack, this is a solid option with a super polished design that some will prefer over Apple’s unique battery case design. 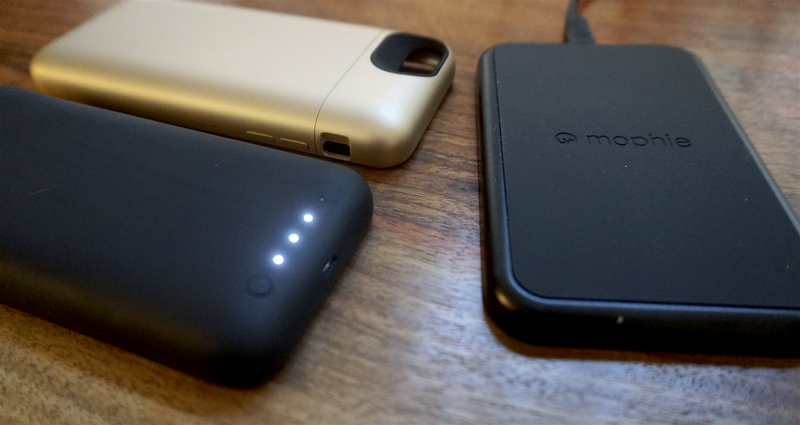 The added benefit of the wireless charging pad and other accessories in Mophie’s lineup might be an extra incentive if any of that functionality interests you. 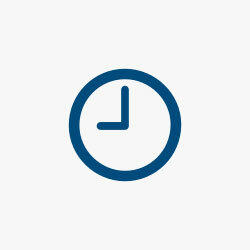 It remains one of the best options despite few notable upgrades over earlier versions. You can buy the Mophie Juice Pack Air in a handful of color options now for $99 on Amazon and the Mophie Charge Force Qi wireless charging accessories start at $39.